His father worried when Andrei Aranda (LL.M. ’17) told him he was leaving home to further his legal education in the United States. Aranda, who grew up in Chihuahua, Mexico, was already trained as an attorney there but felt a calling to help Mexican and Latin American immigrants navigate the complex U.S. immigration system. “It was tough to come from another country as an adult with a different language and culture and go to law school to pursue a master’s degree,” Aranda said. He first heard about the St. Mary’s School of Law from a friend (and St. Mary’s alum) while working for the Consulate General of Mexico in Dallas. During his time at St. Mary’s, Aranda said, he enjoyed the robust nature of the LL.M. program. He felt like the classes were difficult, and the professors were tough, yet they were always willing to help students understand the material. “I know I made the right choice,” he said. 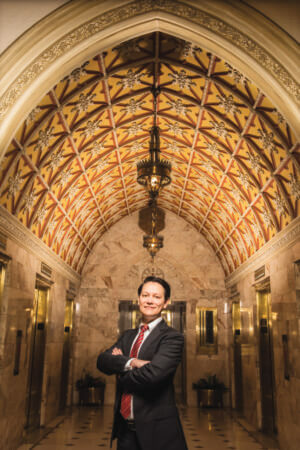 Although he excelled in his classes, Aranda knew it would be an imposing task, as a foreign-trained lawyer, to pass the Texas Bar Examination. “For me, the secret was to stay focused,” he said. In 2017, he earned his LL.M. in American Legal Studies and passed the bar exam on his first try. He became a U.S.-licensed attorney and joined the Elizabeth Reed Law Firm in San Antonio, practicing employment-based immigration law.